From start to finish, a small group of men and women volunteers along with the UW Athletic Department staff handle all of the planning and execution of the Crazylegs Classic. Many of volunteers come back year after year because they enjoy the “work” and want to help the athletic program and are passionate about the history and tradition of the Crazylegs Classic. Click here to sign up to volunteer for the Crazylegs Classic. Or call the Crazylegs Classic hotline at (608) 261–LEGS (5347) for assistance. Please do this prior to April 16th. On Saturday morning (race day), volunteers are needed at the race starting lines by 8:30am. The run and walk starts are located on Library Mall near downtown Madison. You will assist with setting up barricades, corralling the participants, controlling the “Wave” lineups, and coordinating the Student-Athlete volunteers. 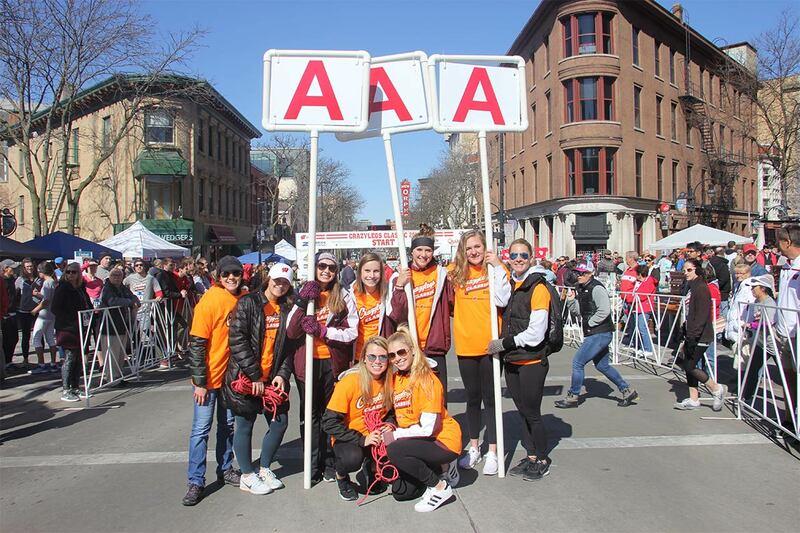 At the race finish lines in Camp Randall Stadium, volunteer coordinators will make sure all the barricades and signage is properly staged, assist with directing participants into the stands, and hand out water bottles to the finishers. On Friday (day before race) from 10:00am – 7:00pm and Saturday morning (race day) from 7:00 – 9:30am, volunteers are needed to either assist with the walk–up registration, the bib assignment area, or the distribution of the Crazylegs t–shirts at the Kohl Center or satellite HyVee locations in Madison. The shifts assigned are either on Friday, 9:30am – 3:00pm or 2:45pm – 7:00pm OR on Saturday, 6:45am – 9:30am. You will receive a Crazylegs volunteer T–shirt and complimentary snacks and beverages are available during the shifts. You will function as a traffic cop for the participants in the run / walk on Saturday morning (race day). You will be assigned a specific location and should report to your area by 9:00am on race day. You are the eyes and ears of the race and your role is vital. You will be given a Crazylegs volunteer t-shirt at that time. We are asking you to bring a cell phone (911) to report any injury or related problem should an accident occur. Your shift will end at approximately 12:30pm or when the last runner passes which will be followed by a police bicyclist. When you receive your T-shirt on race day, you should also receive a coupon for a complimentary hot dog and beverage to be redeemed at the Post Race Celebration held at Camp Randall Stadium. On Saturday morning (race day), you should report to Lot 76 (2501 University Bay Drive) by 9:00 am. Your area supervisor will give you a Crazylegs T-shirt. Be prepared to fill a lot of cups because there may be at least 10,000 runners! Your shift is over at approximately 12:30 pm or when the last runner passes which will be followed by a police bicyclist. When you receive your T-shirt on race day, you should also receive a coupon for a complimentary hot dog and beverage to be redeemed at the Post Race Celebration held at Camp Randall Stadium.